Experience Real High Definition 1920x1080P video and Image quality. Uses digital signal and reduces signal loss compared to analog signal transmission. Cameras and NVR are 1080P unlike other sellers selling lesser resolution cameras. 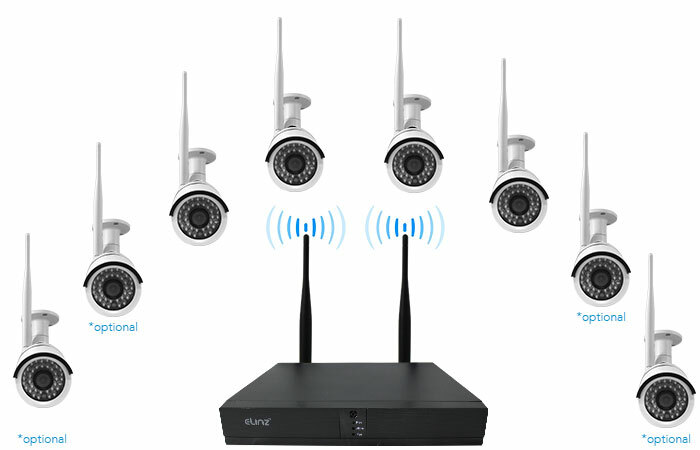 The Wireless security camera system equipped with 8 Channel NVR plus 4 cameras, allows you to add more cameras in future. 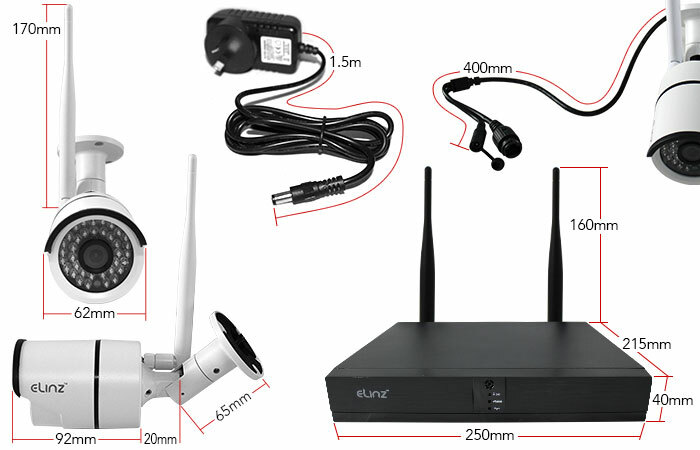 Easiest wireless security camera system, It's real plug and play without messy cabling. Simply mount the cameras, plug in the power adapters and go. 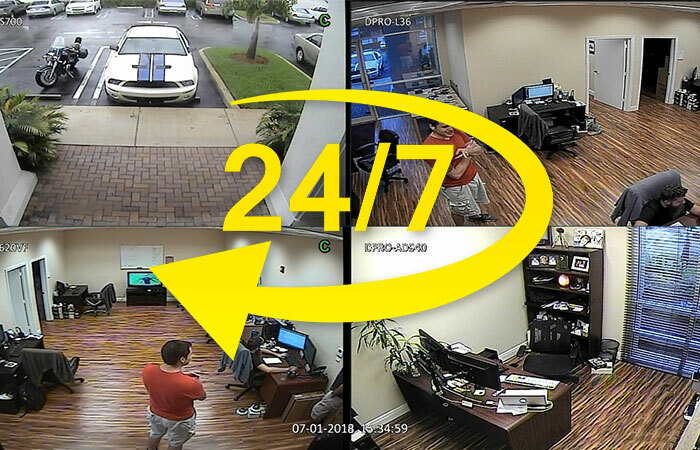 Capture high quality clear image and video on your security camera compared to others using cheap image sensors. View live camera recording, take photos and videos either locally on your monitors, or remotely on your phones through "XMEye" App. 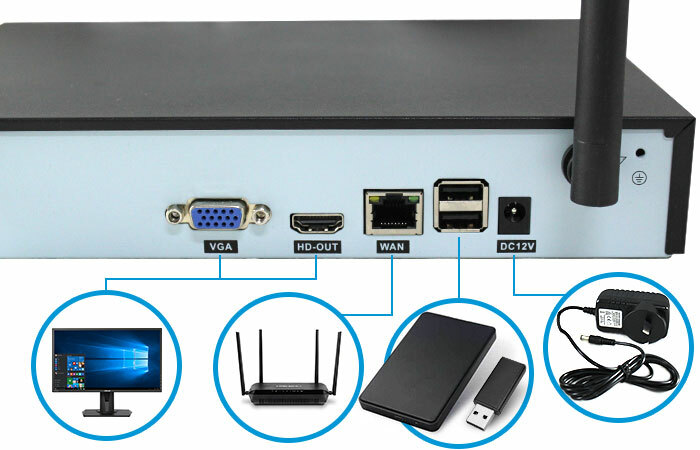 Allows you to remotely view live video up to 8 cameras simultaneously anytime and anywhere on your mobile devices by WiFi or 2G/3G/4G network via XMeye App. Take snapshots and record live video directly on your mobile devices. Never miss any suspicious moments with the smart motion-triggered alarm function, and you can customize which areas on the cameras’ live view will trigger an motion alert. 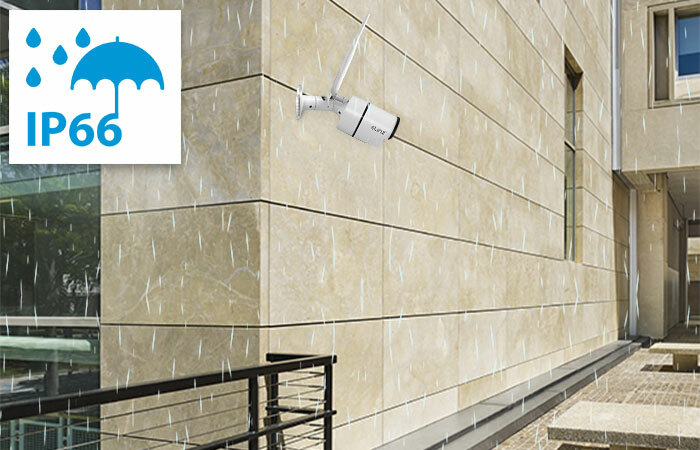 All cameras are designed to withstand severe weather conditions. 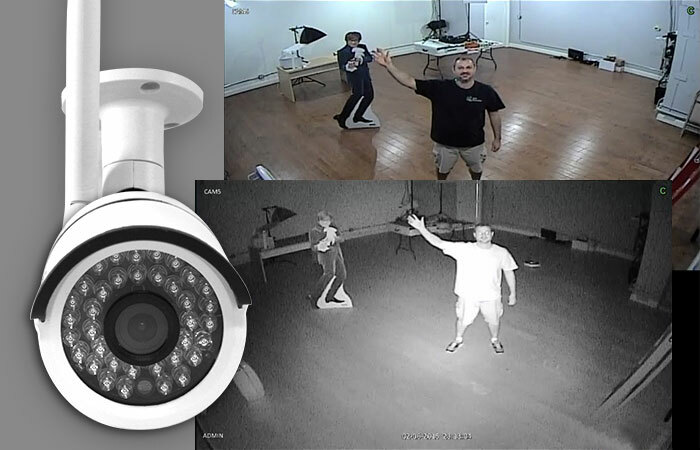 Install the cameras outdoors or indoors to keep your home or business safe. 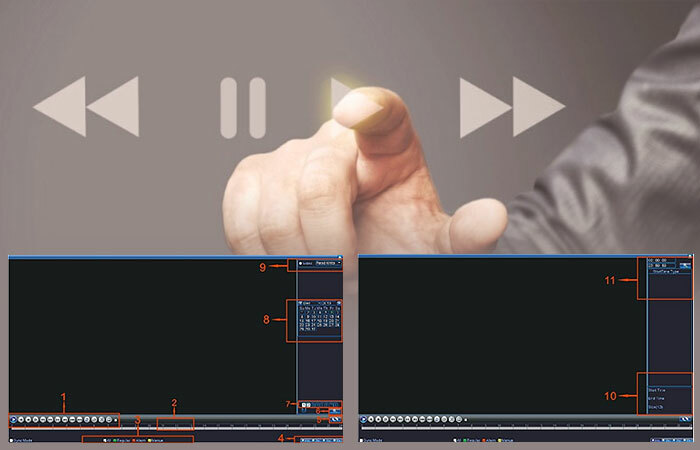 Smart IR cut automatically switches between day and night. Wireless signals are capable and can penetrate at least 2 walls. Providing strong Digital Transmission Signal and anti-interference ability. Wireless transmission distance 50m up to 3 walls, and 500m in open space. A built-in USB port gives you the option of backing up and transferring your video footage with a USB flash drive or external hard drive. 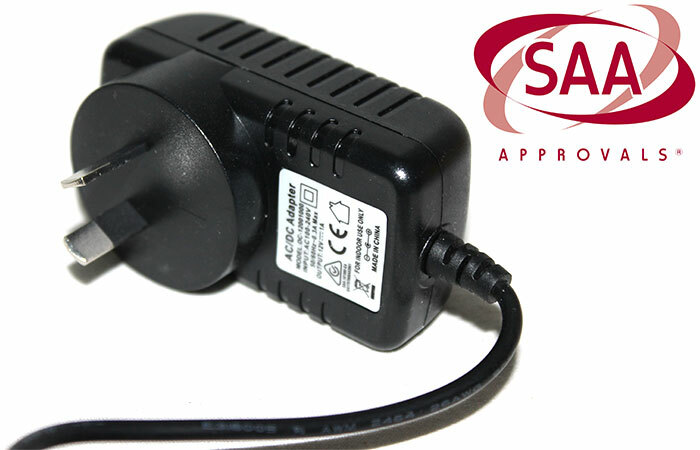 Charging won't be a problem as the package comes with an SAA approved wall charger making it safe for home use. The cameras come with metal casing, unlike as other sellers with plastic casing. 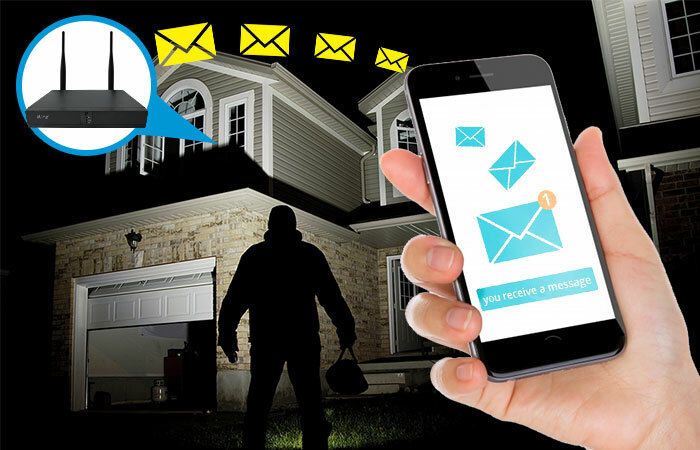 Safety and security is important to every one of us not just at home but also to business owners. Keeping an eye on them while you are not around gives us more confidence that everything is in good condition. 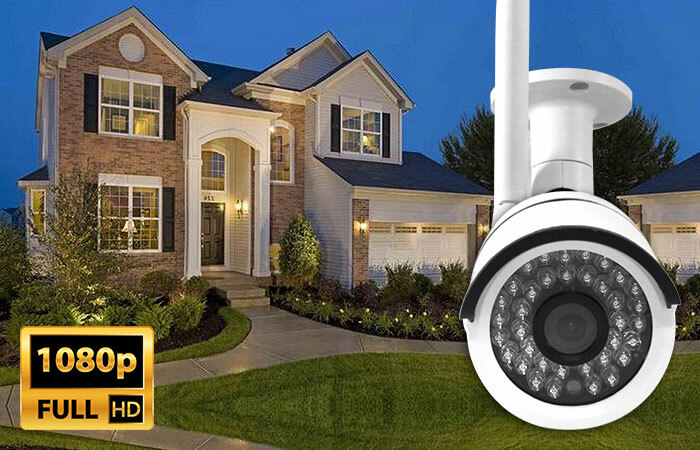 With this New 8 Channel Wireless CCTV Security camera Sytem, you can check on your home, business, students at school, mall securityand more. Having 8 channels, you can install up to 8 cameras to survey the whole area. This wireless security camera provides you high definition images and video quality as it has 1920x1080P resolution. 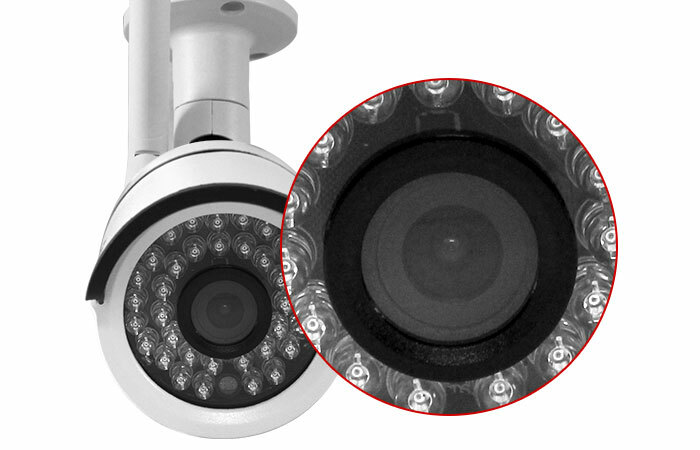 With 36pcs IR LEDs the camera can provide clear night vision with uniform luminance up to 25M. 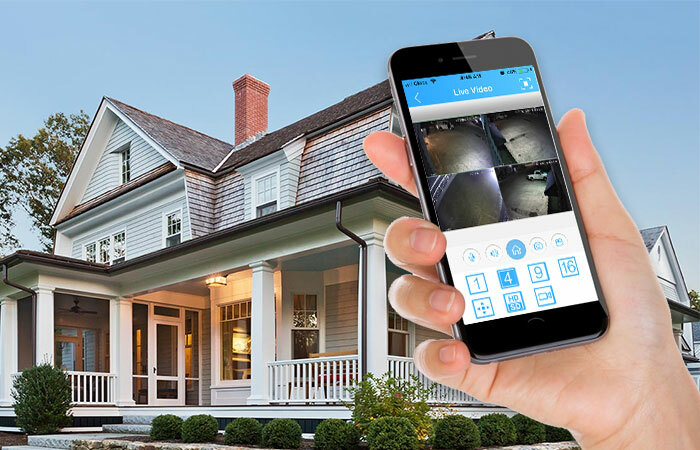 This security system has motion detection which automatically captures photo and smart push notifications to your mobile. Monitor or watch videos through your mobile using "XMEye" App that is suitable for both Android and IOS mobile devices. 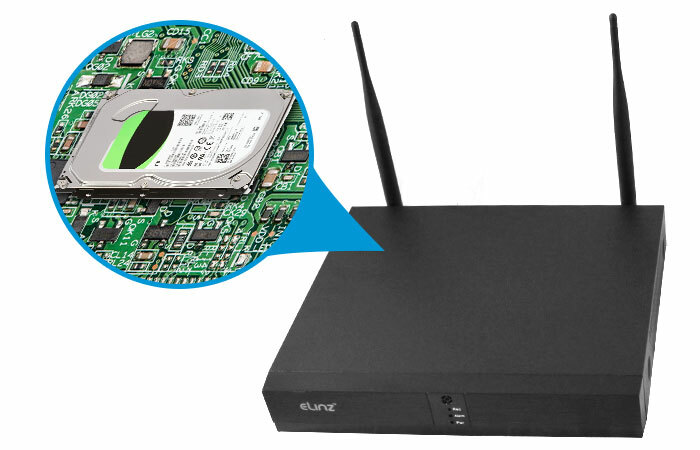 A security camera for 24/7 continuous recording has pre-installed 1TB hard drive. No worries about the installation as it’s like plug and play, without messy cabling. Start installing one now not just at home but also suitable for offices, schools, supermarkets, malls, retail outlets, restaurants and more. Experience High Definition 1920x1080P Video and Image quality. Uses Digital Signal and reduces signal loss compared to analog signal transmission and provides high quality 1080P image quality. 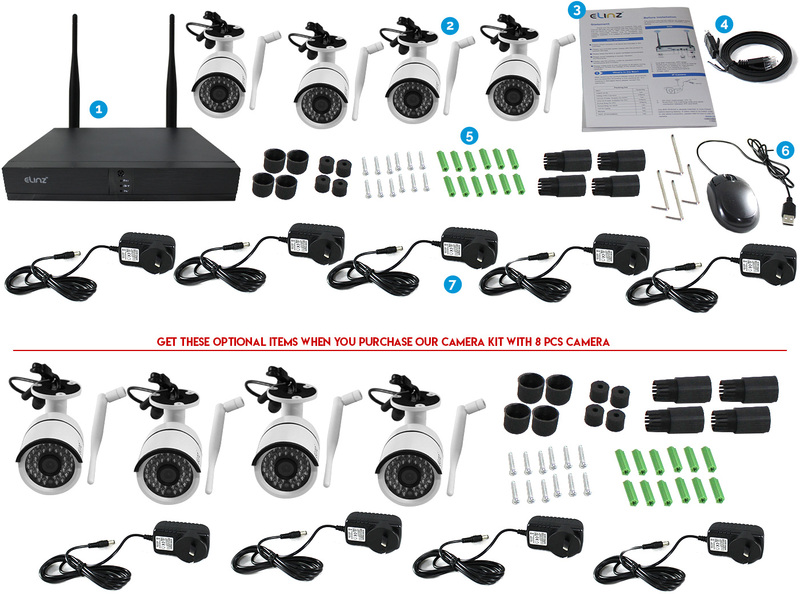 The Wireless Security Camera System equipped with 8 Channel NVR plus 4 or 8 cameras (please select the number of camera kits at option above), allows you to add more cameras in future. 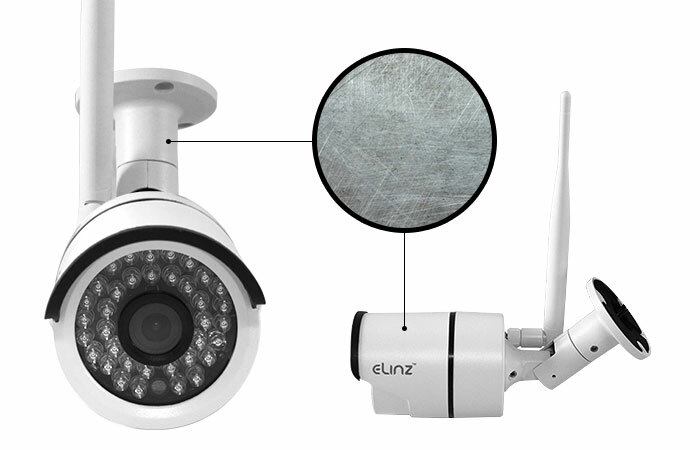 Easiest wireless security camera system, It's real plug and play without messy cabling. Simply mount the cameras, plug in the power adapters and go. Each camera needs to be plugged into a nearby outlet for power. It is Pre-installed with 1TB hard drive and records the videos day and night non-stop. Video feed is saved to the included 1TB hard drive. Watch the playback either locally on your monitors, or watch live video remotely on your phones through "XMEye" App. View your cameras on smart phone anywhere anytime when wifi or 2G/3G/4G data is available via Xmeye App. 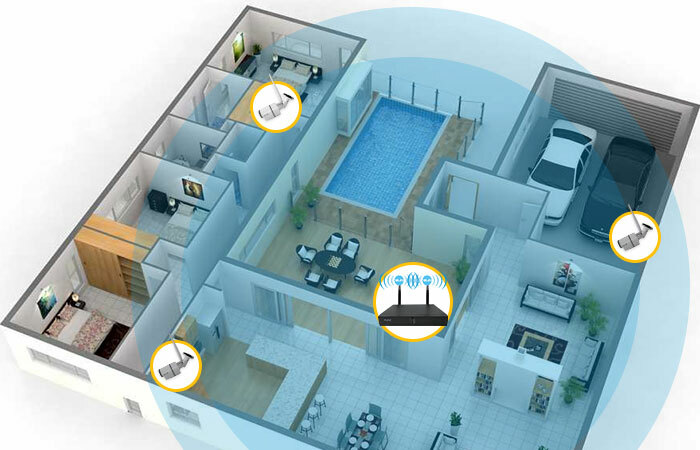 Wireless signals are capable and can penetrate at least 2 walls. Providing strong Digital Transmission Signal and anti-interference ability. Providing high definition quality videos. A built in USB port gives you the option of backing up and transferring your video footage with a USB flash drive or external hard drive.